Mysuru: State BJP President and former CM B.S. Yeddyurappa has accused Chief Minister Siddharamaiah of dividing Veerashaiva-Lingayat Community only for stopping him (BSY) from occupying the seat of Chief Minister. Addressing a campaign rally for K.R. Constituency BJP candidate S.A. Ramdas at Gavi Mutt, Gowrishankarnagar here on Monday, Yeddyurappa alleged that Siddharamaiah can go to any extent to meet his selfish ends. Reiterating that Siddharamaiah was out to divide the society on caste and communal lines, Yeddyurappa claimed that Siddharamaiah has now maintained silence on the issue fearing backlash in the elections. Maintaining that there was a BJP wave across the State, the BJP leader expressed confidence that the party’s ‘Mission-150’ will be achieved in the Assembly polls. Asserting that Siddharamaiah will be the last Congress Chief Minister of the State, he appealed the electorate to elect BJP candidates S.A. Ramdas (KR), L. Nagendra (Chamaraja) and Sandesh Swamy (NR Constituency) with huge margins. Yeddyurappa also addressed rallies in Chamaraja and NR Assembly segments of the city, during which he lashed out at Siddharamaiah Government, listing its failures and maladministration. He appealed the voters to elect party candidates L. Nagendra (Chamaraja) and Sandesh Swamy (NR). Earlier, Yeddyurappa held an impressive Road Show travelling atop an open vehicle in Gowrishankarnagar and other areas coming under KR Constituency. Party candidate S.A. Ramdas, MP Pratap Simha, KR Block BJP President B.V. Manjunath and others took part. Many Congress leaders joined BJP on the occasion. 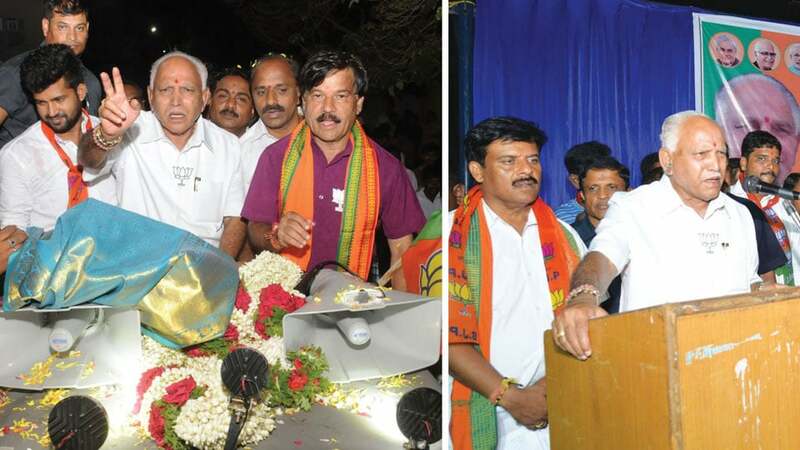 The BJP State President held Road Show at Hebbal and surrounding areas coming under Chamaraja Constituency. 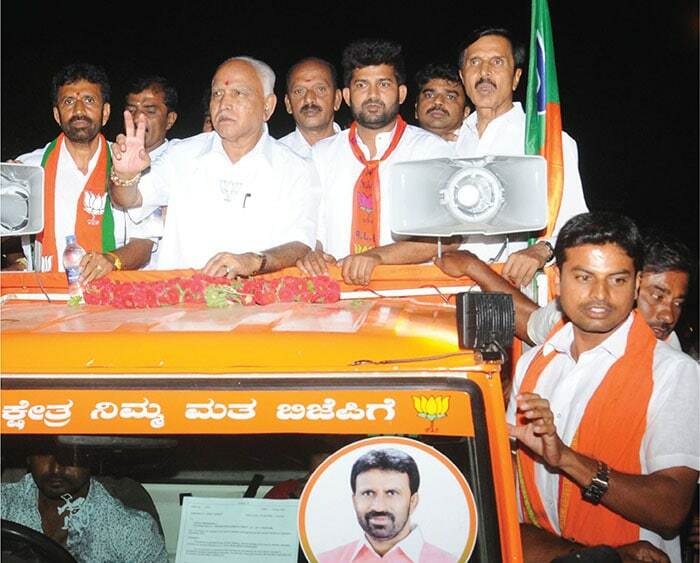 Party candidate L. Nagendra, MP Pratap Simha, Senior leader D. Madegowda and others accompanied the former CM. Even as Yeddyurappa was addressing the gathering, it began to rain. But braving the rain, Yeddyurappa continued his speech holding umbrella. Even the crowd didn’t seem to bother about the rain and listened to him. Continuing his campaign in the city, Yeddyurappa after undertaking a door-to-door campaign at a few places in NR Constituency, addressed a massive gathering at N.R. Mohalla’s Maruthi Circle. Party candidate Sandesh Swamy, City BJP President Dr. B.H. Manjunath, Corporator Nandeesh Preetham, leaders K.P. Nanjundi, K. Shivaram, B.P. Manjunath, Renukaradhya and others were present. all those real lingayats/veerasahaivs must not vote to congress but vote only for bjp. People shouldn’t listen to a tainted person. BJP talks big things like Deshprem, Hindutva etc but in reality it supports people who had gone to jail & project such person as CM candidate. It also fields mining thieves & their brothers (8 tickets) from the Party. God, save our country! PM Modi who is a scholar in “Man ki Bath” does not speak about Reddy brothers. A clever move! The other party is a caste & family based party. Now our people have to decide which is a relatively better party to vote! Congress National President Rahul Gandhi released its Karnataka State manifesto today and its clearly a trailer of the Anti Hindu stance that Siddaramaiah has so blatantly displayed in the past 5 years. Our team found 7 major promises and announcements in the Congress Manifesto that would be making even Tipu Sultan blush! Lingayats can Rest in Peace, because after all the theatrics created by the Congress government around declaring Lingayats as a minority religion, they have ended up announcing a startling 4% reservation to the Muslims in Government appointments. Yes, this is not an economic reservation but a desperate attempt on behalf of the Congress to give a green hue to the elections. Try searching for the word Hindu or Temples in the Congress Manifesto and well the search results are staggering! ZERO, Yes a big zero is what you get. All religions but “Hinduism” is what the “Janeudhaari” Shri Shri Rahul Gandhi has promised to uplift. What is even more shocking is the fact that Congress is going around thumping its chest claiming that they are a Muslim organization. Asaduddin Owaisi would be facing a serious identity crisis looking at the polarisation that the self proclaimed Brahmin of the nation. Yes, because only children from the Minorities deserve to go to schools, correct? Not schools, but “Maulana Azad” schools for minorities! With 75% literacy rate, the state should be striving to give quality education to all, but Mr, Siddaramaiah and the Shehzaada are willing to give a communal colour even to education and categorically call out 60,000 minority students in a state with over 1 crore children. Don’t be surprised if the holy Quran is made compulsory in all schools. And it only gets better. Not even in Taluks with high Muslim population, the Maulana schools for minority students will be set up in every Taluk. One might wonder why could it not be just a school, and had to be a Maulana school for minorities, but alas that’s what one can expect from Janeudhaari Muslims. Different surveys have shown that Unemployment is one of the biggest menace being faced by the youth of Karnataka. Mr. Siddaramaiah could have done so much better had a board been set up for administratively solving the issue. But no, employment is only meant for the religions that can be wooed by the “Secular” party. If giving triple the funds to Maulvis as compared to Hindu priests was not sufficient, WAQF support is the next weapon the Congress wants to polarise the peaceful citizens of the state. Under Congress rule, Roti Kapda aur makaan, all of it can be yours as long as you are anyone but a Hindu! Bravo!! Soft Loans to minorities to setup educational institutions. Dear Siddaramaiah, why don’t you just declare Urdu as the official language for imparting education in the state! Forget education, land, government jobs but Congress has shamelessly gone to the extent of dividing even the united and hardworking auto and taxi drivers, by being partial in giving health insurance and education cover to the children of only Minority Auto and Taxi drivers. What’s next Mr. Rahul Gandhi? So, the next time we take an auto do we need to pay extra basis the religion of the driver?